At Hog Roast Caterer we aim to provide high quality tasty food to all our guests for any occasion. Create the perfect feast that you and your guests will never forget. Impress your loved ones with a great selection of tasty treats they will always remember. Whether you want a hog roast to warm you up on bonfire night or at a Christmas party or you dream of a BBQ in the summer time we are more than happy to provide the perfect food for your perfect event. 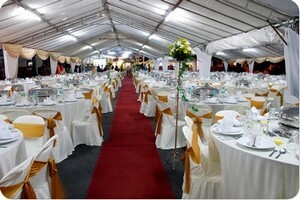 Our corporate hospitality menus almost mirror our party menus but are applied differently. Able to vary our service options, our corporate menus are built around making your meeting a successful one. Where good food may be the deal-maker (believe us, we’ve seen it happen), the food we deliver at the corporate hog roast catered events not only come with our hallmark great taste, but feature the ability for bespoke service so that you can worry about other things and rest assured that your prospective clients will have happy stomachs. Imagine the perfect feast: What does it include? Maybe you envisage hot, juicy pork that has been cooked to absolute perfection and melts slowly in your mouth. Accompanied by crunchy crackling and tangy apple source. 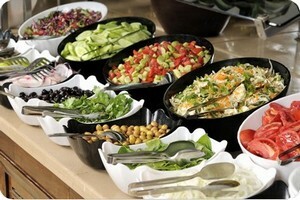 Perhaps you imagine mouth watering sides such as fresh inventive salads, vegetables and soft floury bread rolls. You may picture tempting canapés to start your wonderful feast or irresistible starters. You may wish to include indulging puddings to your fantasy banquets. Your dream cuisine might be a traditional sit down meal or a relaxed buffet, it could even be a fun BBQ. And who would you want to share this treat with? A small group of close friends or thousands of others? Yes we all have our own dream catering plan and for your next special occasion/ family get together or business event why not make this dream a reality by calling Hog roast Caterer Whatever the occasion, whatever the number of guests and whatever type of food you require we are more than happy to help. Take a look at our sample menus today and browse through private party menu, corporate menus or wedding menus to find a package that’s suitable for you. Don’t have your ideal menu available? No problem call or email us and we will be more than happy to adapt and develop to create your dream feast. Our hog roast catered events have become celebrated in many regions of the fair Isles of Great Britain. With a catering history that could fill numerous volumes in an Edwardian library, we pride ourselves on offering our customers the widest possible choice in every which way we can. Perspective being as important as it ever has been in the world of catering, we feel that choice is the operative word in maintaining success within the company, as it ultimately leads to success on your plates. Where people all over the United Kingdom have begun to experience much higher standards of cuisine that a few decades ago (much due to the rise of the celebrity chef alongside heightened awareness within the sphere of natural and organic ingredient procurement), it is pivotal that the modern day caterer can integrate the notion of versatility into their respective catering repertoires. Our party menu options come in the numerical format for ease of viewing by our customers, new and old, when and as they view our easy to view website (www.chefandgriddle.co.uk). For all your party or function catering needs, you are sure to find the right menu for you within the five options shown. Varying from the simple, right through to the extravagant, our private party menus are there to make your life easier by displaying the choices that are most commonly grouped together in terms of the menu wishes of our previous customers. Menu 1, for example, displays a menu option which is very popular with sports teams and informal parties all over the country. As simple as it comes, this menu takes advantage of a whole hog, or more hogs if there are hundreds of you, combined with our floured rolls, apple sauce and expertly prepared crackling. Moving on from this, the party menu options grow more and more elaborate from that point on, gaining salad and vegetable options, with added choices in the variety of meats that are available, all beautifully hog and spit roasted to give that beautiful flavour at your party event. Hog Roast Caterer has been providing outstanding service throughout the UK for many years. Call us today and see why we will still be creating and delivering fantasy feasts for many more years to come.